Scoop.it curation tool crawls more than 35 million web pages every day. With a user base of over 10 million and advanced filtering, the tool’s machine learning technology pulls up pertinent results and prioritizes posts according to relevance. 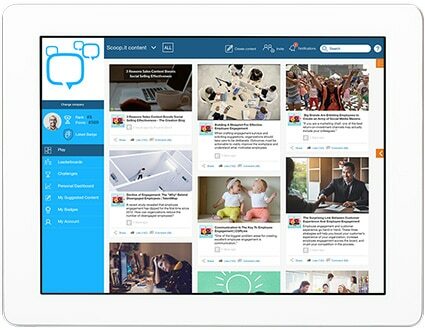 With Sociabble Curation Powered by Scoop.it incorporate fresh, relevant, third-party content for your employee advocates and social sellers. 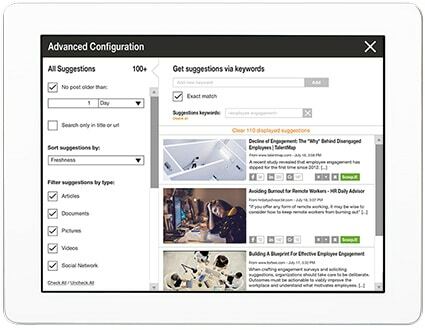 Create topic-specific searches with end-user groups in mind and link Scoop.it feeds to content channels on Sociabble. Why Is Third-Party Content Important? You create Scoop.it searches using the tool’s advanced filtering criteria. The content you select is added to themed Scoop.it feeds. These feeds are linked to channels on Sociabble, with approved curated content appearing on the platform. 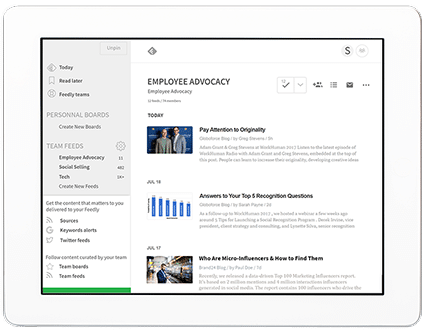 With a clean, minimalist user experience, Feedly makes it easy for teams to work together on the curation of third-party content. 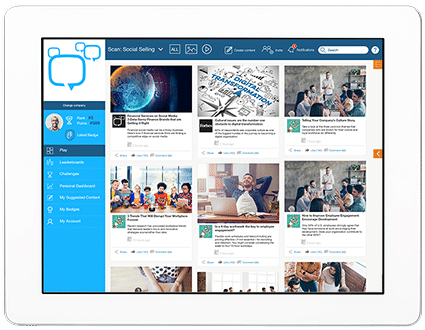 The platform’s simple interface has multi-member access, allowing teams to create and collaborate on shared content boards. 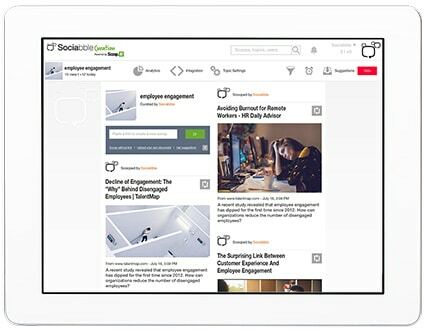 With Sociabble Content Powered by Feedly, you can enable specific teams to work together on content curation. Alternatively, you can use the tool to reward top advocates by inviting them to a select community of content curators. Users create Feedly searches using the tool’s advanced filtering criteria. The content selected by individuals is pinned to collective Feedly boards. These boards are linked to channels on Sociabble, with approved content appearing on the platform. integrations can do for your company?